Airmar's marine and industrial sensors serve a wide range of international markets. 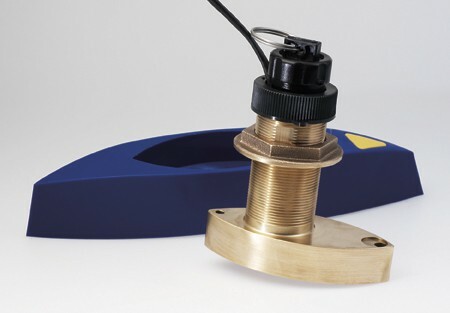 Our marine product line includes fishfinder transducers that mount through the hull, in the hull, and on the transom. We also offer temperature sensors, NMEA 0183 sensors, and NMEA 2000® sensors. Our high-performance, 1 kW transducers use broadband technology which enhances overall fishfinder function. Airmar also has a full line of survey-echosounder and portable-survey transducers including models suitable for shallow water, harbor survey, deep water, ocean survey, and sub-bottom profiling. The industrial line includes ultrasonic air transducers for a wide variety of applications including: flow and level measurement, automation control, proximity sensing, tank level sensing, distance measurement. These TRIDUCER® multisensors feature depth, speed, and temperature in a single housing–drill only one hole in the boat! The 50/200 kHz, dual-frequency, single ceramic element provides good target detail in shallow water. The M260 is our best-performing, in-hull model for 300 W to 1 kW echosounders. Its construction utilizes separate 50 kHz and 200 kHz elements for excellent deep-water performance and exceptional bottom and water-column detail. The PB200 WeatherStation® Instrument informs you of instantaneous changes in the weather. Wind Speed and Direction are measured using four ultrasonic transducers; no moving parts make it durable and reliable. 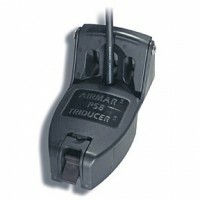 Airmar's most-affordable, dual-frequency, 50/200 kHz, transom-mount design. It combines depth, speed, and temperature functions in one housing. Few parts make installation simple, and its compact size is attractive to small-boat owners.